If you follow Nintendo hardware rumors in any capacity, it likely won’t come as a surprise to you, but for everyone else, I hope this is great news. Nintendo will be releasing a SNES Classic Edition this fall, September 29. This will be pretty much the same concept as the NES Classic Edition but with a few modifications. 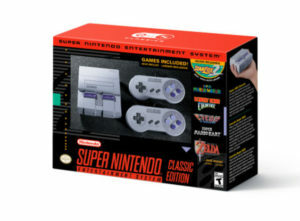 The big changes are that it comes with 2 controllers instead of one, it will only have 21 games instead of 30, and finally it will be priced at $80 instead of $60 plus $10 for a second controller, as was the NES Classic. I personally don’t find these changes as too much of a surprise. While this list if very different from mine and Andrew’s lists, it does have some crossover. However, the biggest surprise on the list is the previously unreleased Star Fox 2. From a personal perspective, I am really pleased to see the inclusion of Super Mario RPG, Final Fantasy 3 (instead of 2), and Mega Man X. The fact that the console comes with 4 classic and excellent RPGs is great news as well. For many people, this will be their first time playing them. Andrew scored 12 titles on his list. Earthbound, Final Fantasy III, F-Zero, Link to the Past, Mega Man X, Star Fox, Street Fighter II Turbo, Castlevania IV, Mario Kart, Super Mario RPG, Super Mario World, and Super Metroid. I scored a lowly 10 titles. Donkey Kong Country, Earthbound, Final Fantasy III, Link to the Past, Mega Man X, Secret of Mana, Star Fox, Super Mario Kart, Super Mario World, and Super Metroid. Our readers collectively scored 15, of the predictions we published. You guys are good. The only thing I am wary of with this news is the lack of information on controller cord length. My hope is that Nintendo learned from the NES Classic and the controllers have cords that are at least 8 feet in length, or to include wireless controllers. This is Nintendo, however, and the likelihood of them learning is pretty low. The other important lesson is to make enough of these to supply the demand. Nintendo failed to do this with the NES Classic. Thankfully Nintendo has confirmed that they are going to make way more of these than the NES counterpart, but they are still mum on the exact numbers. They have also confirmed that this is a limited edition device and won’t be in production after the initial 2017 run. So make sure you get out to the store early on September 29 if you want one of these at MSRP. If you wait too long, you will likely miss out if you aren’t willing to pay triple to a scalper. « Molehill Mountain Episode 53 – Silly E3 Awards! I shall now perform the Dance of Gloating for having Star Fox 2 on my list. Seriously though, I’m excited, and want to see what the actual finish product is, not what the two major dev versions that got leaked. Will it have co-op? Was that taken out? How about the pacing, did that change? No amount of learning on Nintendo’s part is going to change the fact that I²C, which is how Nunchucks communicate with Wiimotes, is a short range protocol designed for communication between components on the same circuit board, and is ill-suited, electrically, to go longer distances.